I got to know about the Spanish rockers from ELDORADO back in 2008, when they released their debut album “En Busca De Eldorado”. See my review here. I liked their tunes so much that the follow-up, “Dorado” / “Gold” (2009), was also sent to me for examination. See the result here. However, I found it, at the time, not as strong as the debut album, mainly because it didn’t rock as much. But overall, ELDORADO proved to be a band to reckon with. Since that release, the band has put out Spanish and English versions of their works. This also counts for the third album, which I didn’t (get to) review: “Paranormal Radio” / “Antigravity Sound Machine” (2012). It all begins with “Mad Woman”, which sounds quite live, judging by the start of the song. It’s exactly how such things are done in a live setting. METALLICA also tried something similar with the intro of “Hit The Lights” (on their “Kill ‘Em All” album, 1983). And then the song takes off with jolly grooving, Bluesy Rock. The clean vocals go well with the music. Airplay should be no problem whatsoever. The organ, together with the guitar, takes care of the melodic aspect and will do so on numerous occasions on this album. This song has a good, almost happy vibe, and it sounds as if the guys had a lot of fun recording it. “Evil People” takes it slower and has the organ as key instrument. Contrast is created between the verses (sounding a little mysterious and emotional) and the chorus, where full musical volume is unleashed. This song is not as straight-forward as the others: there’s more room for breaks and twists. Instrumental talk is reserved for the middle, including the solos (again delivered by guitar and organ), which sounded a little too short for my taste. Afterwards it’s back to business. Good stuff, but I wouldn’t consider it a highlight. In “Breathe The Night”, the band goes acoustic, which gives the song a special, exotic and even Folky (via the violin) touch. This ballad forms a nice resting point and should do very well on stage. “Goodbye & Carry On” is a slow rocksong, yet heavy and groovy enough, also thanks to the organ. This instrument fills the melodic holes in the chorus. It’s nice to hear how the band plays with momentum, so to speak: incorporating a silent, calm moment and so bringing back the music. And how! This thing rocks! After that, all returns to the regular flow. Another highlight is “I’ll Be Satisfied”, another pumping, organ-driven Rocksong with a Bluesy touch. Around halfway, the organ gets its moment of glory, a little later joined by the guitar, before all flows back to the normal pattern. Once again, good vibes here. In addition, when it’s just vocals and drums in the chorus (of course the rest of the band falls in a little later), this will be excellent on stage, to have the crowd sing along. “Flowers Of Envy” is also a ballad(-like) track and emotional as well. The importance of the organ is not to be denied. Contrast is created between the calm verses and the powerful (by lack of a better term) chorus. Extra spice is added via the wild solo. Very refreshing is “Resurrection Song”, consisting of the acoustic guitar, a flute and, obviously, the organ. This Folky song is an excellent way to digest the rocking stuff that preceded. “You Don’t Wanna Need Her” is a firm, midtempo, organ-driven Bluesy rocker. ELDORADO delivers the goods, nothing more needs to be said. This brings us to the longest track then on “Babylonia Haze”, namely “Karma Generator”. With almost 12 minutes of music, you’re not getting a 3-minute song that was stretched to about four times its size. It’s advised you give it multiple spins to properly appreciate it. A mysterious, atmospheric intro is the beginning of this song. Slowly the music advances, first in a calm fashion and steadily adding the Rock touch. Yes, the organ is leading the way. Around halfway, the band shifts into a higher gear, which allows for more power, groove and revving; crescendo, as they say. However, I personally find that the calmness of the beginning should have lasted a little while longer or at least returned at the end of the song. And last, another ballad to end the haze soothingly: “Moon Girl”. Just vocals and the piano at first, the guitars and drums join in later. The middle of the song holds a nice revolving door, so to speak. “En Busca De Eldorado” was a very good album, hard rocking songs mixed with more Bluesy, melodic tunes. The next albums saw the band change direction a little, going for a slightly more accessible version of their music, yet continuing to rock. As the years passed by, ELDORADO continued to perfect their style, feeling like fish in the water. The hard work and several gigs culminated in one of their best albums – although I still like the sound and style of “En Busca De Eldorado” very much -, i.e. 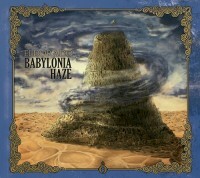 “Karma Generator” / “Babylonia Haze”. The material is of high quality, the production is very good and I see no reason why anyone into this kind of (Classic, Bluesy) Rock should not have this album in his/her collection. This is one of the highlights of 2015, without question!